Academy Award® winner for Best Animated Feature Film (Bob Persichetti, Peter Ramsey, Rodney Rothman, Phil Lord and Christopher Miller). 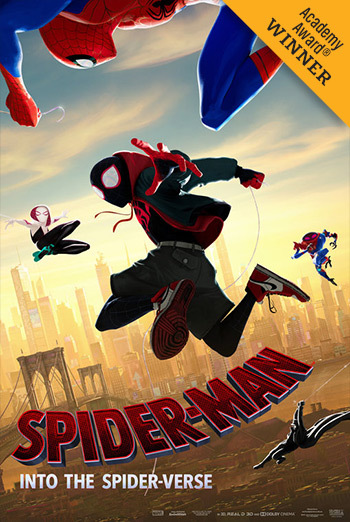 Phil Lord and Christopher Miller, the creative minds behind The Lego Movie and 21 Jump Street, bring their unique talents to a fresh vision of a different Spider-Man Universe, with a groundbreaking visual style that’s the first of its kind. "Spider-Man: Into the Spider-Verse" introduces Brooklyn teen Miles Morales (Shameik Moore), and the limitless possibilities of the Spider-Verse, where more than one can wear the mask. Consumer Advice:(BC) Violence. (AB) Violence. (SK) Violence. (MB) Violence. (ON) Violence.